In 2010, Matt Pluhowski received the Rookie of the Year Award. Over the past several seasons, Matt has been nothing less but outstanding! Currently, Matt is a civil engineering major going into his senior year at Manhattan College. This will also be his fourth year as a Division I pole vaulter for the Jaspers. Over the years, Smith Point has had one weakness – crafts. Matt Pluhowski is changing all of that. This season with a 2nd place finish in the boat race and 3rd in the surf ski at regionals, he plans to work on “crafting skills” over the winter and come back stronger then ever. His passion is contagious as more Smith Point lifeguards jump in the workouts with Pluhowski. Matt’s kindness, hard work and selfless attitude has paid off, thus making him the 2015 Smith Point Lifeguard of the Year. Congratulations Matt “Baby Blu” Pluhowski! Brett Friedman graduated from Shoreham Wading River, where he played football and lacrosse. Currently Brett is attending Salve Regina University, where he plays lacrosse. Brett plans on pursing fitness and nutrition at S.R.U. in the near future. 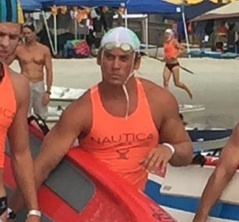 Being a lifeguard has brought out the best qualities in him as an individual. On the beach he constantly demonstrates qualities such as hard work, dedication, determination, and consistency. Brett is a very athletic, dedicated young individual that loves to compete, help others and assure that all patrons at Smith Point Beach will have a great day, every day.